When it comes to plants with winter flowers, there are more choices than you might expect to add life to your winter landscape. My first choice for flowers for the winter garden is always pansies and violas. These charmers add color and fragrance to your garden in winter and can be used in so many ways--as bedding plants for masses of color, as borders, as accents, to overplant spring bulbs, and in containers. Other annuals for consideration include snapdragons, dianthus, alyssum and ornamental cabbages and kales. Bulbs that bloom in late winter/early spring are a delight, and can be naturalized in drifts of color that will increase every year. 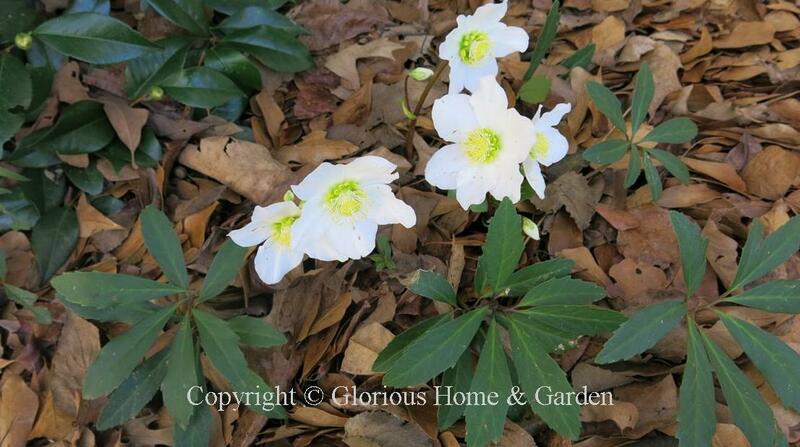 Hellebores, certainly, are a must for the winter garden. These tough perennials are beautiful, long-lasting and (mostly) easy to grow. There are a surprising lot of winter-blooming shrubs and trees. Though most bloom during periods of warmth and closer to spring, they let us know that winter is almost over, and often have the added bonus of delightful fragrance. Pansies and Violas, Zones 4-11. 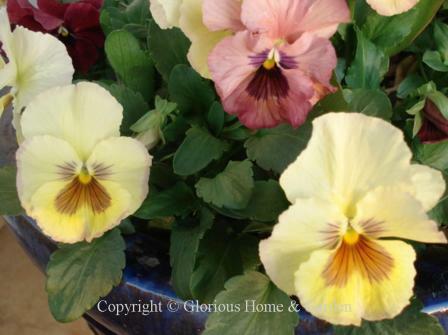 Pansies and violas are much loved for their rainbow of beautiful colors, cheerful "faces" and fresh scent. In the milder areas of the country (Zones 7 and above) they are planted in the fall to overwinter and will bloom in the fall, slow down during the coldest part of winter and resume as the days lengthen. They are best treated as annuals because by the end of May they begin to languish in the growing heat and can be replaced with summer annuals. Crocuses--There are crocuses that bloom in spring and fall, and there are a few that are extra early and bloom in late winter to early spring. Crocus etruscus, Zones 5-8. Pale lilac. Crocus imperati, Zones 5-9. Striped yellow on the outside, purple on the inside. 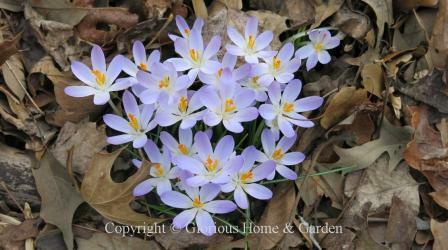 Crocus sieberi 'Violet Queen,' Zones 3-8. Violet. Crocus tommasinianus, Tommasini's crocus Zones 3-8. Purple. Nicknamed "tommies" these charmers bloom in late winter to early spring and are great to naturalize in large drifts under the still bare trees where they can be left undisturbed to increase in number. Eranthis hyemalis, winter aconites, Zones 4-9. These small bright yellow flowers look like they are wearing green Elizabethan collars and often open before the snowdrops. 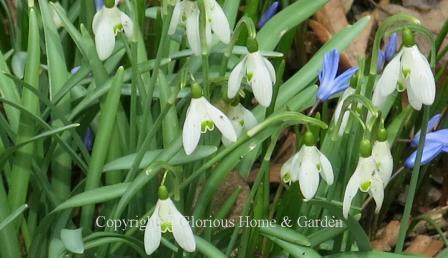 Galanthus nivalis, snowdrops, Zones 3-7. A true harbinger of spring, snowdrops emerge from the ground in late winter or early spring--sometimes peeking through the snow. The three pure white petals that flare out like little rotors and the inner cup tinged with green are freshness itself. Snowdrops will perform better in colder climates. Plant in drifts under trees where they will be undisturbed and they will multiply into a magnificent display. Iris danfordiae, Zones 5-9. 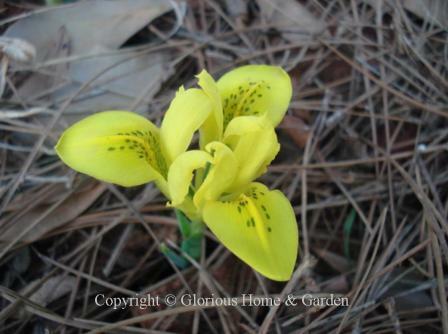 This small bright greenish-yellow iris with brown spots on the falls blooms close to the ground, and provides welcome winter flowers of cheery color at the gloomiest time of the year. Plant a few in drifts in the fall, or tuck a few in pockets on the edges of beds or under trees where they will be undisturbed. Iris reticulata, reticulated iris, Zones 5-8. 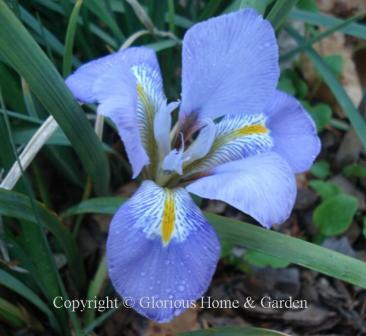 A small iris that blooms in late winter or early spring depending on location and the weather, the reticulated iris is named for the net-like veining on the petals. The color range is pale blue to deep violet usually with some markings of white or yellow. Iris unguicularis, Algerian iris, Zones 7-9. 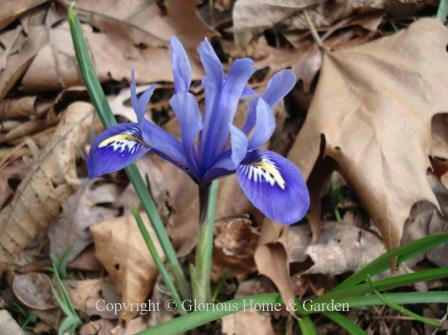 Known as the winter iris, this North African native blooms in late winter into spring close to the ground as if to protect itself from the winter chill. Best for milder climates similar to its Mediterranean origins. Leucojum vernum, spring snowflake, Zones 4-8. 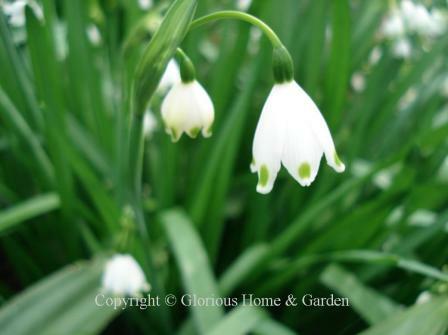 Nodding white bells with a drop of spring green at their tips, make a charming display in a woodland setting when planted en masse. Helleborus foetidus, stinking hellebore, Zones 6-7. Don't let the common name put you off! 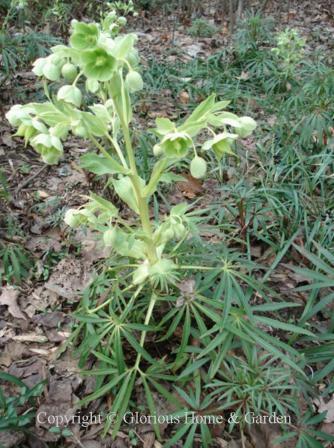 A bad odor is not readily noticeable, and you can call it bear's foot hellebore, if you prefer. Whatever you call it, this hellebore is a handsome addition to the woodland garden, with narrow dark evergreen leaves and pale, creamy-greenish flowers tinged with a bit of rose around the edges. It will self-seed where happy, preferring moist, humusy, alkaline soils. Be aware that the plant is highly poisonous in all its parts. Helleborus niger, Christmas rose, Zones 3-8. Helleborus niger is a beautiful plant under the right conditions--it prefers moist, humusy alkaline soil in a shady location. The pure white flowers with centers of golden stamens fade to pink as they mature and bloom before H. orientalis. Helleborus orientalis, Lenten rose, Zones 4-9. No shady winter garden is complete without Lenten roses. They are tough plants, long-lasting, heat and drought tolerant and readily self-seed where happy--the perfect winter flowers.. They are available shades of pure white, pink, mauve, plum, purple, and greenish to reds, yellows and near black. The large, leathery palmate leaves are evergreen and attractive all year. Click here for shrubs with winter flowers. Click here for trees with winter flowers.